Perennial Diversity represents a decade of growing and selecting potatoes for smaller size and persistance through winter with little cultivation. 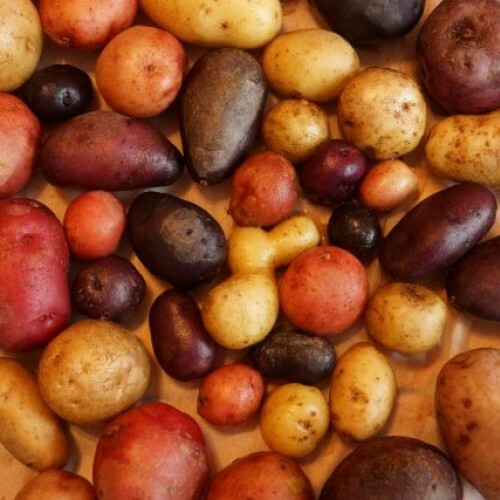 We started with certain selections of heirloom potatoes, fruited them and then raised their seedlings while selecting over time for small tubers and winter hardiness. For the last several years, we quit cultivating them entirely and waited until fall of 2018 to harvest them. 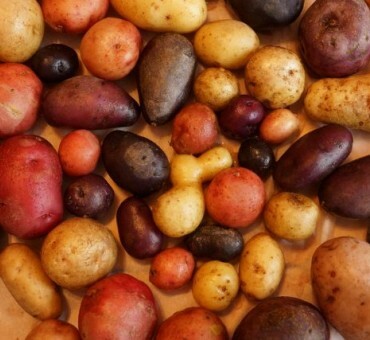 We offer a 4 pack of four distinct genetically different potatoes with the basic three colors, red, blue and white. Some are fingerlings and some are more round shaped and vary in size from 1-3 inches. This is the mature size of the tuber and not summer harvested. Some of the seedlings may grow larger under cultivation. Red, blue, white, pink and violet are the colors in this mix. The textures range from smooth to flakey with a true potato taste like no other-subtle but delicious. You can also purchase true seed of these to test and breed on your own. We recommend spring planting with this strain. It is not necessary to use heavy mulch to get them to survive. So far few Colorado potato beetles have consumed the foliage. It appears small size favors winter hardiness as well as persistance in the landscape and yes, it spreads. Available in the fall of 2019 and spring of 2020. -10F to -15F Ground hardiness is unknown but tubers resist freezing fully or partially most winters. Sprawling to 2 ft. tall. Sprawling to 4-8 ft. long vines. Diploid selections. Fruitfulness is low usually but not non existent. Sandy well drained soil is ideal. Northern temperate selection but adaptable in other climates. Not tested outside Michigan. Easiest potato selection we have grown.